It's on my list of "TO DO's" for this week... is it on yours too? Buying our pumpkins for the season! When the kids were younger we sometimes visited a pumpkin patch or area pumpkin farm. Nowadays however I'm more likely to pick them up at the grocery store and *try* to find time when the kids are free to carve them! As a matter of fact, last year we couldn't do it all together due to crazy schedules so the kids did them separately when they had time. As they've gotten older we sure do have some awesome designs though! Everything from the Scream face to Jack Skellington - the Pumpkin King. If you are looking for templates or stencils I've found a few FREE online sites that you can print from. From beginner to advanced they have templates for all age groups and talents. Readers Digest has a slide show of simple patters, just click on the link next to the photo you like. 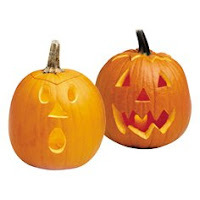 You may have to spend $4 on a pumpkin... but at least the template stencils are free and that's in everyone's budget!